Sean Corbett, Sales Director of Mortgage123 gave an interview on Property Matters on Dublin South 93.9 FM. During the interview, Sean gave listeners some of his expert advice on how to prepare for a mortgage, particularly in a competitive property market. In Picture: Sean Corbett, Mortgage123; Amanda Bone, Bone Architects; Carol Tallon, Property Matters radio host; Darragh Lynch, Darragh Lynch Architects; Peter Brown, Property Matters. How do lenders assess a mortgage applicant? Sean emphasised that preparation is the key to getting a mortgage approval. He said the lenders will review the last 6 months bank statements for all applicants to see whether they properly manage their finances. To leave a good impression on a bank lender, applicants should show how well they can manage their finances, income and expenditure, over the 6 months prior to application. In general, you need to show that you can afford the new mortgage payment, plus have some room for interest rate increases. For this, the bank will look at your savings (the increase in your balance from the start 6 months ago, to the closing balance), it will look for proof in your current account statement as to whether you are paying rent (to an unconnected party only), whether you are paying other loans that will be fully cleared before mortgage is issued, these will help you to afford a mortgage payment. They will also look at other costs, you must have enough money to buy food and basics once you move into your new home, if you have children, you must be still able to provide for them and that reduces the amount available to pay the mortgage!Do you have loans that will not be cleared? Do you have other fixed commitments, such as pension contributions, family maintenance commitments etc.? Your age will also affect how much you can borrow, most lenders will want a mortgage repaid by 65, so if you are 55, you have a much shorter term than a 30-year-old, this reflects in higher repayments and therefore can reduce affordability. The lender wants to see that you are at least somewhat wise in your spending – no online gambling either winning or losing, no daily spend at the off-licence, no excess clothing expenditure. You should demonstrate that you operate your account and spending sensibly, do not go into regular overdraft and do not have missed payments or bounced cheques for 6 months. Apply via ICB.ie for your credit report. It is not FREE to obtain. Have your proof of savings should you have saved your deposit, or some part of it. First time buyers need a 10% deposit, but lenders will allow this to be gifted if you can demonstrate other financial prudence. The lender will also assess whether the property is suitable for mortgage purposes – is the valuation fair, has the valuer noted any concerns over condition, location, access or any other matter. Sean also talked about what to do in the event that a buyer is self-employed. In this case, the last two years before looking to get a mortgage are crucial. This can be a very complicated area and Sean outlined the importance of finding a broker as opposed to simply going straight to the bank. He said that at Mortgage123, finding the right broker is made simple by providing a “live chat” option on the Mortgage123 website. This chat means that potential clients who are viewing the website can ask questions or make contact for a meeting by simply clicking the chat option. Look into Switching lenders if you are paying more than 3% p.a. Some of the other questions asked during the interview included queries regarding competition in the housing market and switching lenders if needed. Sean explained that in his experience, when it comes to rates, the competition is huge and there is a certain area of the market that is particularly competitive. In this case, the amount that it is possible to borrow varies greatly. Sean also advised listeners to switch lenders if they are paying more than a 3% p.a. interest rate to the lender. Are Exceptions likely to run out this year? The general rule of thumb is that you can borrow 3.5 times your yearly income. Banks are allowed to make an exception and lend up to 4.5 times yearly income in certain circumstances. It is also important to note that lenders have a limited amount of these exceptions each year. It is certain that the lenders will run out of exceptions, some may run out sooner than others. A broker is familiar with how banks work and which are more likely to make an exception for certain type of mortgage applications. The ‘too much hassle’ mentality when it comes to switching mortgages may cost mortgage holders thousands according to preliminary results from our Mortgage123 Switcher Survey. The Mortgage123 Survey invites Irish mortgage holders to answer a few simple questions relating to their current mortgages. The respondents may test their own knowledge of their mortgages. Mortgages are like any other service provided to customers, but for some reasons mortgage holders in Ireland do not view mortgages the same way as their broadband, electricity or phone. The preliminary results from 28 respondents show that 18% did not know what mortgage rate they were paying. Over 48% were paying over 2.3% interest rate per annum and could possibly switch to a better provider. While 89% of respondents were aware that they could switch their mortgage, only 14% had switched their mortgage in the past 5 years. This was not the case for switching other service providers, such as phone and electricity services, where 83% switching was reported. The main reason provided by our respondents were that they thought it will be too much Hassle (61%). Source: Preliminary results from Mortgage123 Survey. These responses, although inconclusive, suggest that Irish mortgage holders are not very familiar with what a mortgage switcher involves. When we calculate for them how much they could save if they reduce their mortgage term by as little as 0.1% p.a. or shorten the mortgage term by a few years, they are pleasantly surprised. In fact, the Central Bank of Ireland is attempting to raise awareness of mortgage switching. New Central Bank rules relating to current mortgage holders have come into force since January 2019. These rules are in response to 2015 findings that more than one fifth of borrowers could save money by switching. The new rules will make it easier for bank customers to get information about savings on their mortgages. Furthermore, this will encourage competitiveness in the market and better mortgage rates for customers. Although the Central bank has extended new rules to raise awareness of switching, identifying the best deal on the market may require some professional advice. There isn’t enough awareness that brokers can do that switch at no cost and recommend the best available switch. At Mortgage123, we pride ourselves on our Mortgage Switcher service. Great News! Our excellent service has been recognised again! Mortgage123 is shortlisted for the Mortgage Broker of the Year Award at the 2019 LPI Financial Broker awards! 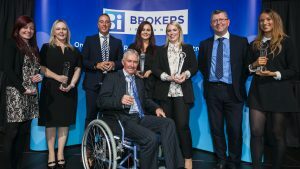 The annual Life, Pension & Investment Broker Awards recognises Irish brokers who have proven their excellence and dedication in maintaining high professional standards in the Irish market over the past year. 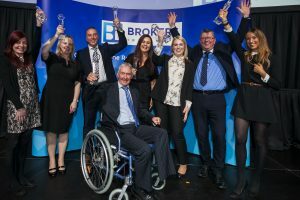 The 2019 LPI Financial Broker awards will be held on Thursday 21st March 2019 in the Round Room at Mansion House, Dublin. The best mortgage team of 2018 has welcomed 2019 with 7 new recruits in our new head office on 48 O’Connell Street, Limerick. Who has Joined the Mortgage123 Team? We are proud to create new jobs in Limerick to support our nationwide and Irish expat mortgage broker service. Mortgage123 was established in 2015 by Eamon Lynch as the mortgage wing of IPS Financial Advice Limited. The rapid growth of the team from two members to 19 in the space of two years is largely credited to the fostered team culture of ‘can do’ attitude and motivation to become one of the leading mortgage brokers in Ireland. As a young team, the mortgage wing of IPS has been working tirelessly to establish the mortgage service and build the brand. Our focus is completely on customer service making a sometimes stressful and complicated process as stress free as possible for our clients. Marie Feehily, Mortgage Advisor – Marie is an experienced mortgage advisor who joined the Mortgage123 team in November 2018. She started her career in the financial services industry in 1998 having completed her BA degree in UCD. Much of her career was spent as a Mortgage Advisor with Permanent TSB in her home town of Nenagh, Co Tipperary. She is also well known in dog show circles for her award-winning German Shepherd show dogs. Graduate Mortgage Advisors – In January 2019, four new advisors started their careers with Mortgage123 on our graduate training programme, Nicole Dundon, Amanda O’Brien, Levi Howard and Laura Mansbridge are working alongside experienced advisors and learning the ropes quickly whilst enrolled to study for their QFA exams beginning in May this year. Amanda O’Leary was promoted from her marketing executive position in IPS Financial Advice to Office & Reception Manager in our new offce on 48 O’Connell Street! Robert Bradley joined the administration team in January having worked for over 5 years in financial services administration. Mortgage123 is one of the leading mortgage brokers in Ireland today. Our continued growth has been driven by our efficiency in helping mortgages holders to save on their current mortgages, and new buyers experience a smooth journey to their new home. Customers are provided with modern and versatile ways to get in contact with Mortgage123 and the focus is on receiving immediate response. Enquiries are received by the mortgage advisors via phone, online chat, contact forms, online bookings facility, social media applications and the customer office in Limerick city centre. Potential clients can get in contact in the way most convenient for them. Turn your living area thermostat down to 20°C. The temperature in hallways and bedrooms should be cooler, ideally between 15-18°C. Use the radiator valve to turn the temperature down or off in rooms that you do not use a lot. Set your hot water thermostat to between 60-65°C, to make sure that you do not overheat your water. Most of the energy used by a dishwasher and washing machine is for water heating. Run them on a lower temperature setting and save on your energy costs. Wash clothes at 30°C if they aren’t particularly dirty. Keep your fridge’s temperature at between 2–3°C for the best performance. This keeps your food safe to eat and avoids freezing (and ruining) your fruit and veg. The freezer should be set to -15°C. Turn the heating off when you leave the house or if you go away. Remember, your radiators will continue to heat your home for some time after the heating has been turned off. Switch off all your appliances at night and when you are not home. You should turn off your computer whenever you are not going to use it for more than an hour. Use a power strip which means that at night or when you leave the house, you can easily unplug your devices at once. Turn off lights when you are leaving a room or when you do not need them. When your food is nearly cooked, turn off the rings/oven and use the built up heat to finish cooking your food. Hold off switching on lights in the evening until absolutely necessary. Position your furniture so you make the most of natural light. Replace failed light bulbs with energy efficient options, in particular LED lights. Select the lowest wattage bulb needed to light the room/area and consider the size of the space and how much natural light the space gets. Try to use the washing machine and dishwasher at times when there is lower energy demand and avoid turning it on between 7-9 in the morning and 5-7 at night. This may not save you money but will help avoid excessive CO2 emissions from power stations. Tumble dryers are big energy guzzlers so dry clothes on a clothes horse or washing line. Don’t leave the fridge door open for too long while getting food. For every 10–20 seconds the door is open it takes 45 minutes for the fridge to cool down to its original temperature. Don’t put warm or hot food straight into the fridge or freezer. The fridge or freezer has to work extra hard and draw more energy to cool it down. Thawing food in the fridge is better for keeping your food safe to eat and keeps the fridge cool. Close doors between rooms that are heated and unheated to keep the heat in. Check windows, keyholes and doors for draughts of cold air and plug them. Unused fireplace? A chimney balloon will keep the draughts out and the heat in. Close curtains to keep heat in, but open them in the morning to let the heat of the sun in. A shower typically uses 20% of the energy compared to a full bath, so keep the bath as a treat. Don’t leave the hot tap running – you are pouring energy and money down the drain. Keep your oven door shut and use the space well. Batch cooking saves you time and energy, especially if you have a busy lifestyle. Don’t let the heat escape – by covering your pots and pans with a lid. The lid keeps the heat in and reduces condensation in the kitchen. Use the right sized hob for your pan – the closer the match, the less energy you use. Don’t boil full kettles for one cup of tea, but do make sure you have enough water to cover the element. Fantastic news! 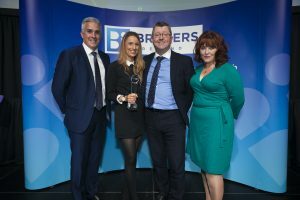 We are the winner of the Team Performance of the Year award at the MyBrokers Ireland Awards 2018 Brokers Ireland. The Team Performance of the year Award recognises teams of staff who foster co-operation, collaboration and open communication while working together on a project or who have extended significant effort that advances organisational goals. Sean Corbett and Aisling McNamara attended the ceremony and received the award on behalf of the team on Thursday, 18th October in the Round Room at the Mansion House, Dublin. We are delighted to announce we will be attending Self Build Live Cork, on the 10th and 11th of November! Come long to the show and meet the team! With such a great turn out at the Dublin show in September, we are very happy to be joining the convention again.